Glide in the Lutyens' Delhi area of New Delhi and explore the best architectures of the national capital on a Segway. An hour of guided Segway ride amidst the serene Lutyens' Delhi. Visit places like the Secretariat, Rashtrapati Bhavan, Amar Jawan Jyoti and many more. Service of a professional guide to take you through the architectural beauties of the Lutyens' Delhi. A well-maintained Segway and protection gears. Named after the famous British architect Edwin Lutyens, Lutyens' Delhi is an area in New Delhi. Edwin Lutyens was an integral part of building designs and architecture when India was under the rule of British during the 1920s, 1930s, and 1940s. Lutyens' Delhi covers the major attractions like Rashtrapati Bhavan, Secretariat and also India gate. The guests are required to report at the Secretariat, New Delhi at your selected time slot (select while booking). Meet the host & guide for the tour here and the tour will start with the orientation session. The guide will train the guests to ride the Segway, help get accustomed to riding it and using operational features. Once the orientation is complete, start the tour with all the safety gears on. Secretariat: The Secretariat was constructed in the 1910s and is home to the most important ministers of Cabinet of India. Rashtrapati Bhawan: Constructed in the year of 1929, Rashtrapati Bhavan is spread across 321 acres and is the home to India's President. Parliament House: The parliament house or the Sansad Bhavan is the where the Indian parliament sits and was designed by Edwin Lutyens and Herbert Baker in 1912-1913. Amar Jawan Jyoti: An Indian memorial constructed after the Indo-Pakistani War of 1971 to commemorate the martyred and unknown soldiers of the Indian Armed Forces who died during the war. India Gate: It is a war memorial located astride Rajpath, India Gate is a memorial to 70,000 soldiers of the British Indian Army who died in the period 1914–21 in the First World War. Along with all these, you will also be witnessing the scenic beauties in Rajpath and several other government buildings. You may as well stop at several places for perfect photographs. The 1-hour tour will complete at the Secretariat for all the guests. The tour is available for members of age 12 years or above only. 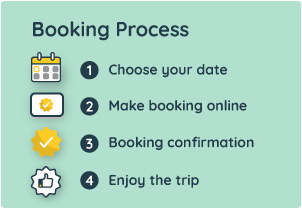 Please select the appropriate variant while booking the tour, the price for weekend and weekdays are different. All guests are requested to wear comfortable walking shoes, sunglasses/sunscreen, scarf and camera if interested in photography. The guests are requested to bring the following during the tour - Water bottle, camera, and its accessories to you enjoy photography and sunglasses.